MADRID (Reuters) - Jorge Lorenzo's celebration of his MotoGP world title on his home island of Mallorca on Thursday was interrupted unexpectedly when the Spanish Yamaha rider suffered what appeared to be minor burns to his leg from a motorcycle. 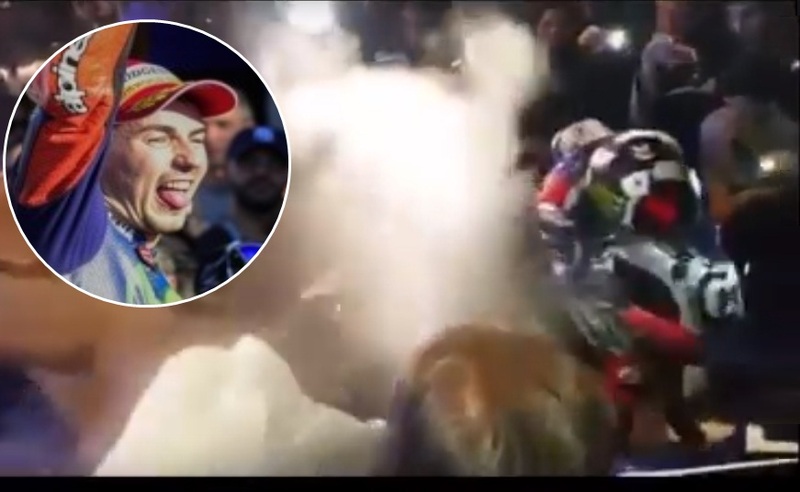 Lorenzo, who wrapped up his third title when he won Sunday's Valencia Grand Prix, was about to leave the airport near the capital Palma to ride in a cavalcade with fans when hot smoke poured out of the machine forcing him to leap off. He later appeared at an event with Balearic Islands president Francina Armengol with a thick bandage covering his left leg from knee to ankle. "If I was able to race in Assen having just had a collarbone operation this is nothing," Lorenzo was quoted as saying in local media. Lorenzo beat Italian Yamaha team mate Valentino Rossi to the title by five points, with Spanish compatriot and defending champion Marc Marquez of Honda third.